What makes a cult classic? To detail the physiology of (in this case) a cult film is to attempt to produce the chicken before the egg, for one cannot create such a movie as meticulously as one may create (for example) a gangster or a war film. A cult film overrides generic concerns, even box-office success, and stands alone as one that is embraced by a subculture for whom it takes on a greater significance than perhaps even its makers had ever envisaged. However, certain “exterior” factors (such as cast and mode of production) may point toward cult film without the film itself being closely examined. In the case of Devil Girl From Mars, merely the fact that it is a British science fiction film made in 1954 establishes a pretty strong case, but once the film itself is consulted, its cult status becomes irrefutable. After a very dramatic start, Devil Girl From Mars slows down the pace to what becomes almost a snail's crawl despite introducing us to British stalwarts of the small and silver screen like Adrienne Corri, Hazel Court and the wonderfully ubiquitous (and lugubrious) John Laurie. It is only the orchestral score that interrupts their insular world, the very ordinariness lulling the audience into a false sense of security before the arrival of the U.F.O. containing the Devil Girl herself. It is astonishing to note that her arrival occurs almost a third of the way into the film, yet so powerful is her presence the film's previously rather dull 23 minutes is forgotten. Technically, the film is surprisingly effective – particularly the 'vaporising' – so it's frustrating that some of the performances (not to mention some of the dialogue) don't come up to scratch. At one point, with the fate of humanity at stake and their own lives in the balance, Michael Carter (Hugh McDermott) consoles the others by saying 'I suppose worse things happen'- but sadly he fails to follow this up by naming any. Although the cast battle valiantly with the script (and with the limited location), it is Patricia Laffan as the Devil Girl who steals the show, giving a bravura performance which is confident and awe-inspiring. It is an irony indeed that the unenviable invasion from Mars provides the positive stimulus in the film, but Devil Girl From Mars is perhaps more interesting in its conception than its realisation. The print quality of this Network DVD is sharp, with only occasional blemishes to the film print evident. A very brief stills gallery (including images of lobby cards and the pressbook) are rather disappointing considering two of the main female stars (Laffan and Corri) are still alive, and would, one supposes, not have turned down an interview. Maybe the film's critical status did not merit a more 'enhanced' treatment, but as a cult film it has got the release it deserves- even if that release, like some of the acting, feels somewhat half-hearted. 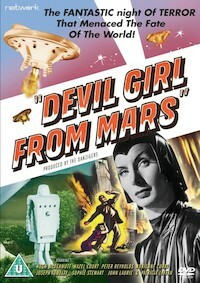 'Devil Girl From Mars' is available from Network.